As soon as that little bottom leaves the seat, the whole lot sails backwards and blocks the foot traffic of passers by. Embarrassing? Yes. Frustrating, as you pick up the contents of your bag while holding onto a child? Most definitely. Dangerous for you and your child? Almost certainly. These ingenious Buggy Weights from Cheeky Rascals will prevent the dreaded pram-tip and save us from red faces and smashed shins. Sold as a set of two, each Buggy Weight weighs eight hundred grams. They fasten securely with a Velcro strip above the front wheels of your pram, allowing you to hang up to six kilograms of weight from your pram handles safely. Strangely enough, the extra weight doesn’t make your pram any heavier to push. Thanks to our reader Amanda for bringing the Buggy Weights to our attention! 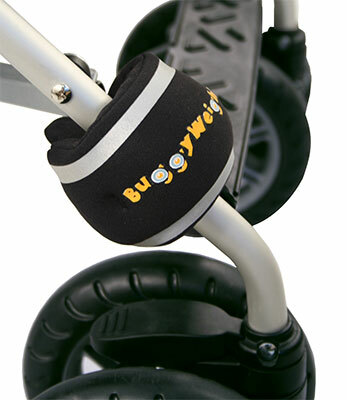 You can buy a set of two Buggy Weights for £15.00 at Cheeky Rascals. International delivery to Australia is available.